"Capping off the concert were five songs by Kurt Weill, ingeniously arranged by jazz composer Nicholas Urie. Even here there were surprises — the opening of “Lonely House” could almost have been part of the Webern. For the most part, though, the songs adroitly walked the delicate line between art and entertainment. So did the performances by Wilder, Watson, and the Criers, all of whom wore their skills with a kind of casual virtuosity." "This is not pretty music, nor is it particularly easy to listen to. But this makes it no less genius. This is music of high intelligence that expects as much as it provides, and what it provides is a listening experience like little else in our barren sonic desert." A U.S. premiere: Kurt Elling in Chicago, with a little Danish on the side. 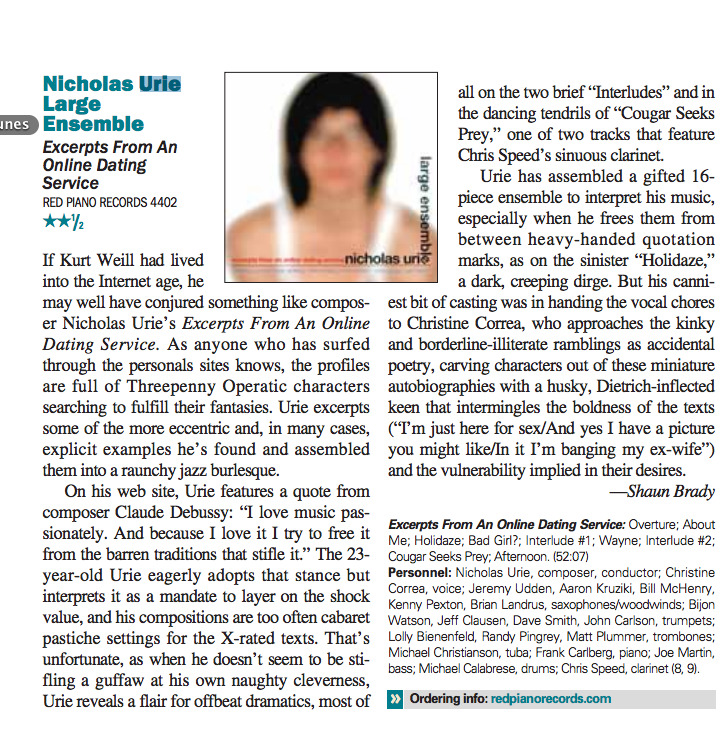 Urie is a 25-year-old wunderkind avant-garde jazz composer whose first album, [Excerpts From An] Online Dating Service, was built around lines snatched from online dating services. My Garden uses the same found-words idea, this time poking through the vast poetry catalog of the late Charles Bukowski. You could quibble with the selections made by Urie, a handful of lines, but this seems representative: “Drinking beer doesn’t make you fat. It makes you lean… against bars, tables, chairs and poles." "All 8 tracks [of Excerpts From an Online Dating Service] are gems, and this CD gets an immediate MOST HIGHLY RECOMMENDED for adventuresome jazz listeners of all persuasions…"
"Excerpts From An Online Dating Service is not just a remarkable first effort, it is a strong and imaginative depiction of a very real aspect of contemporary culture."